According to the Center for Food Satefy at the University of Georgia, sprouts are considered to be among the most risky foods sold at retail. 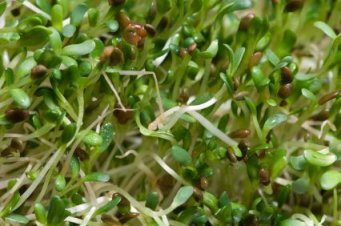 In June 2011 vegetable sprouts from Germany contaminated with bacteria killed more than 30 people and sickened more than 3,000. Since 1990 there have been around 40 sproutbreaks in the US. The warm conditions needed for growing sprouts from seeds are ideal for the growth of salmonella, e. coli, and other bacteria. High risk groups are young primates, older primates, and any primate with a weakend immune system (like diabetic monkeys). If you plan on giving sprouts to your monkey, it is recommended that you cook or stir-fry them which will destroy these harmful bacteria.